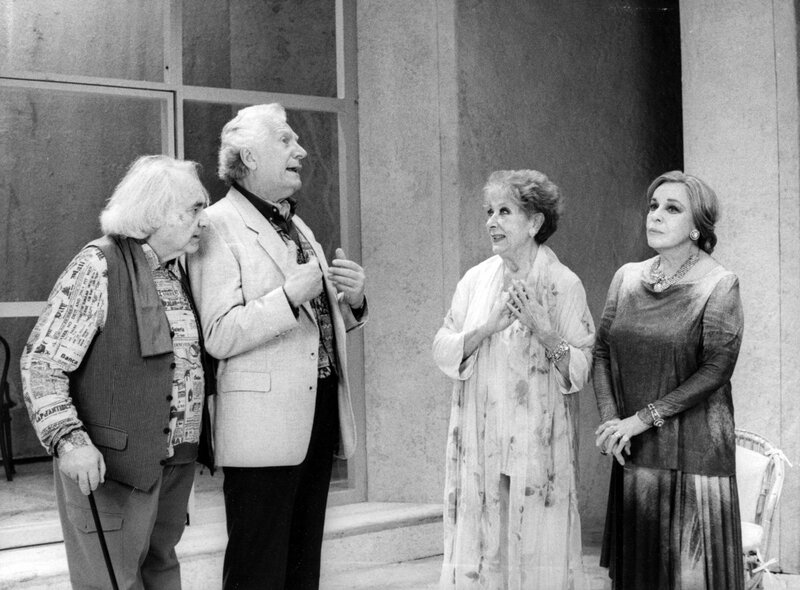 Erica Blanc, Paola Quattrini, Giuseppe Pambieri, and Cochi Ponzoni star in the revival of Harwood's play Quartet, inspired by Milan's Casa Verdi. The Casa di Riposo per Musicisti (Rest Home for Musicians) in Milan is known simply as Casa Verdi (The Verdi Home) and, although Giuseppe Verdi never lived there, his body is buried there, together with that of his wife, Giuseppina Strepponi (the first Abigaille in the premiere of the composer’s Nabucco at La Scala in 1842). The performing rights of Verdi’s operas paid for the home’s construction and later maintenance. A fine gesture. Casa Verdi was designed Camillo Boito, elder brother of poet and composer Arrigo Boito who was the librettist for Verdi’s last two operas, Otello and Falstaff. Although the building was completed in 1899, Verdi didn’t want retired musicians to move in until after his death. He died two years later, and in 1902 the first resident entered Casa Verdi. It stands in piazza Buonarroti (50 metres from where Maria Callas once lived) and since 1913 has Enrico Butti’s giant statue of Verdi in front of it, in the middle of a roundabout. 78-year-old soprano Sara Scuderi, celebrated for her performances of Tosca, was featured in the delightful documentary Il Bacio di Tosca (Tosca’s Kiss), in 1984, where she’s seen acting out scenes in the corridors of the house, and the rivalry between residents is evident. 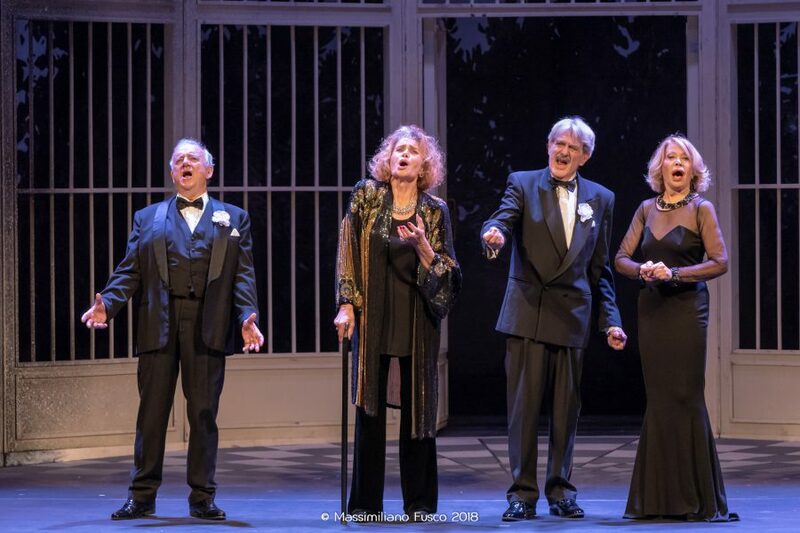 The idea of the egos of retired opera singers and musicians (and today, also dancers) coming together – who was the best, the most famous, the loudest, and who can still perform – was the inspiration for Ronald Harwood, who wrote his play Quartet in 1999, though he set it in England. The four-hander gives a chance for four old troupers to show off and lets the audience laugh a little, as well as reflect on age and memory. It could easily be mawkish, but the latest Italian revival cuts through sentimentality with strong performances from a cast which has an age range from 74 to 78 but as they are all so spritely it wasn’t necessary to feel sorry for any of them. The script goes on and on (and on… it suffers from dementia too every so often) about the fact that the four once sang the Bella figlia dell’amore quartet from Rigoletto together to great acclaim, and that the CD of the recording has just been released. As in Milan’s Casa Verdi, there is a concert to celebrate the anniversary of Verdi’s birth each year. How can the four participate with voices that have not been used in years? With voices that have suffered through years of use on stage and now old age? In one case, with a voice that was no longer heard because of a psychological block, bringing a successful career to an end? It’s not a spoiler to say that they cover their embarrassment by lip-syncing to their old recording. It’s a touching moment. The four gratefully decide to forget their original idea of indossing their old costumes to recreate that moment from their past, and arrive at the concert elegantly dressed with just their voices to remind the audience of their past glory, and their present dress and vitality to show off their current glory. 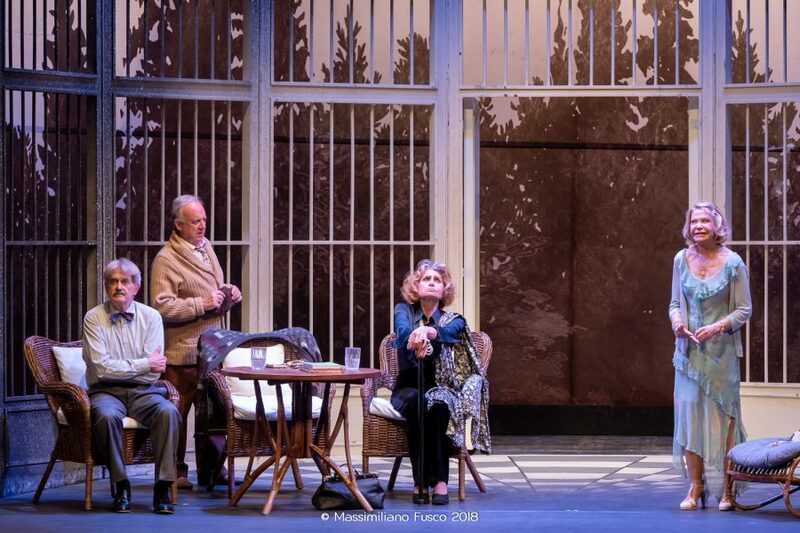 Anna Proclemer, Lauretta Masiero, Mino Bellei, and Mario Maranzana led the cast in an excellent production in 2009. Ten years later, only Mino Bellei is still alive. The director was Patrick Rossi Gastaldi who is the director of the the current revival too, and the play was called Bella figlia dell’amore, though this time around it is simply, Quartet. Erica Blanc, Paola Quattrini, Giuseppe Pambieri, and Cochi Ponzoni have an easy way of tossing off their lines which goes against the fact they are facing death. Sometimes it’s with world-weariness, other times it’s a throw-away double entendre or a witty remark. Kooky 76-year-old Quattrini, known on Facebook for her Gyrotonic videos, sits happily cross-legged in a chair; Pambieri still boasts a rich, booming voice; Ponzoni is youthful in a cheeky Mickey Rooney kind of way; and Blanc – known for some risqué films when she was young – continues to smoulder. The play was at Milan’s Teatro Carcano, which hosted the world premieres of Donizetti’s Anna Bolena and Bellini’s La sonnambula, but now has a rather ugly interior. However, as the curtain closed Renata Scotto, Fiorenza Cossotto, Carlo Bergonzi and Dietrich Fischer-Dieskau’s voices filled the auditorium, and what could be more beautiful than that.